Enter: Greg. He’s a threat. ZMB set out to design a target that allowed for engagement from a 180° vantage point to allow for more realistic training scenarios than traditional paper targets. Most notably, that allows the shooter to engage a realistic profile almost completely from the side. Additionally, in the case of the VRT series, each shot marks the target with a 1/2″ fluorescent orange circle to provide instantaneous marksmanship feedback to the shooter. Specifically with regard to the “Greg” model, the target even allows the shooter to see (roughly) which vital structures their shots might have affected in real life. 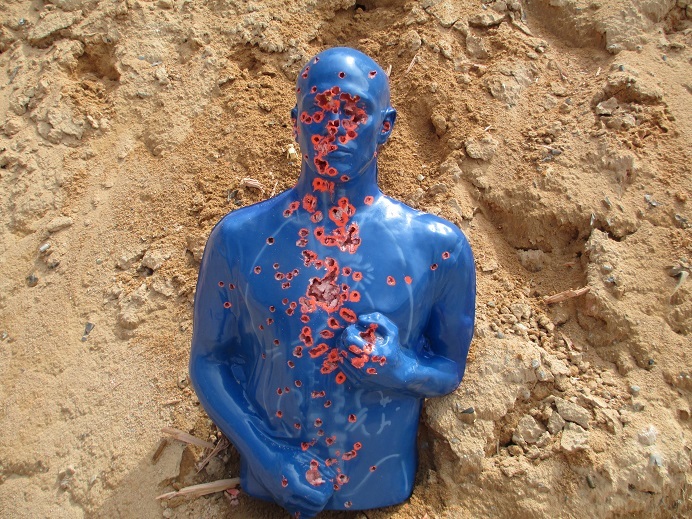 There are targets that show roughly-accurate representations of vitals, and certainly targets that mark when impacted by a bullet, but the Visual Response Target series by ZMB Industries is the first product I’m aware of that does both things and allows for a 180° area of engagement. 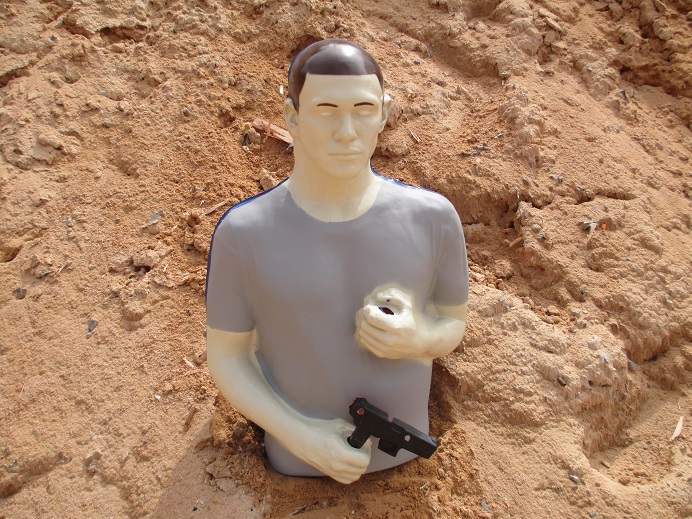 The manufacturer states that the torso can withstand hundreds of rounds from various calibers, and we made sure to give it the full test. We shot it with multiple calibers from 9mm to .45 Auto until we were satisfied that the manufacturer’s claim is legitimate. 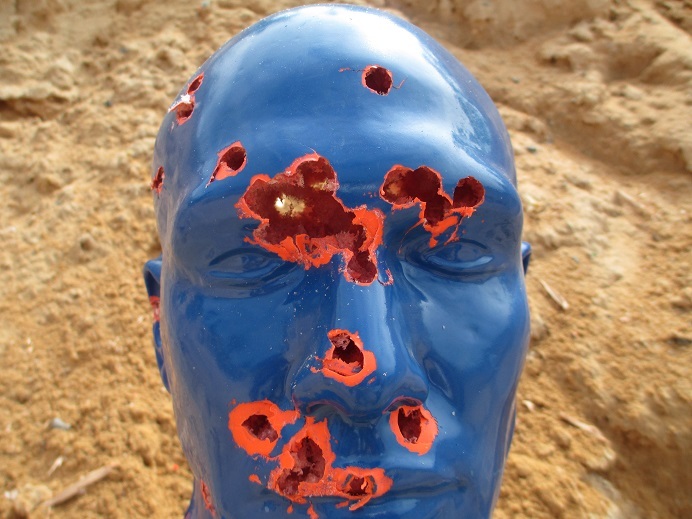 Even after the head was largely one big hole (at right), the target (head included) held together well and allowed for further engagement. When the torso was so marked up with orange circles that only bad hits or called shots on the hands (or ears) provided any noticeable feedback, we elected to try out a non-marking “Jacob” replacement skin. The replacement skin fit right over the shot-up target and made it look like new, so we got back to business. Everyone who helped demo the target seemed to favor the VRT over the NMT (non-marking target) because the marking feature provided instantaneous feedback without having to walk up to the target or take a long time trying to figure out your hits (this would also be a GREAT feature at range with a rifle). Additionally, the Jacob skin didn’t show vitals like the Greg did, which was another of the Greg’s universally-appreciated features. 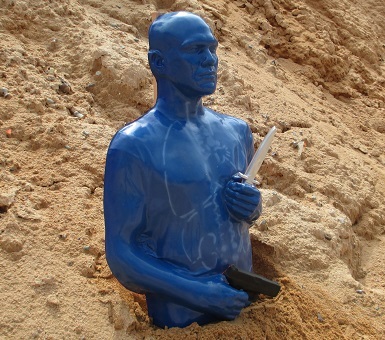 Any ZMB target skins are available in either configuration, though, so if you’re looking for a VRT that isn’t bright blue, that’s no problem. 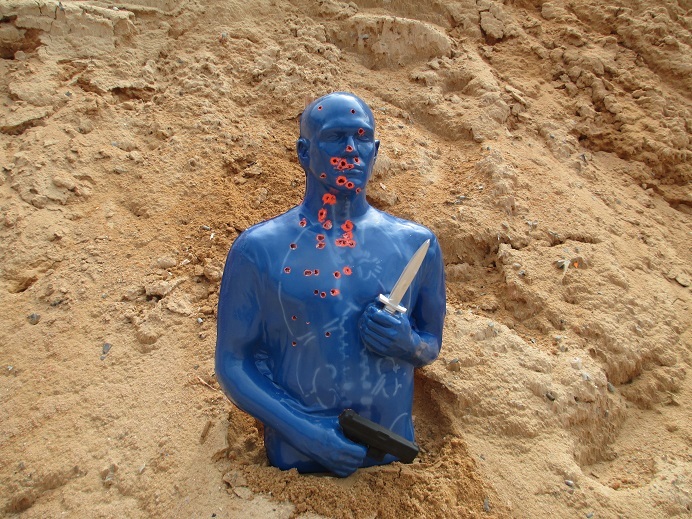 Both types of targets also include various accessories to place in the hands of the targets, should you desire to use them for shoot/no-shoot training exercises or to distinguish an individual target’s threat level (“Glock,” knife, badge, soda can, and cell phone). Naturally, we wanted to shoot this thing, so we put the Glock in one hand and the knife in the other to make Greg as threatening as possible. On top of that, he came at me bro, which was immediately answered by about seven people opening fire simultaneously (thinking through a realistic training scenario wasn’t part of this demo, in case that wasn’t already abundantly clear). The one substantive negative aspect of this product is that the replacement skins are expensive. At $55 a pop, there’s a lot of incentive to make the skin you’re using last a long time (and in their defense, ZMB does also offer color-matched pasters for each target to extend each skin’s useful life). The fact remains, though, that the price is going to keep a lot of people from buying one of these: after all, $100 can get you a nice little amount of ammo, which is also pretty important for live-fire training. But for a valuable training aid, positive feedback on a to-scale torso, or just a fun extra at a local match, these targets are pretty neat. All in all, I think a lot of people may well look at the VRT targets and have some of the same preconceptions about them that we did. So while it may be true that they aren’t in the same price range as standard B-27 silhouette targets that are $1 apiece at any indoor range, these targets offer some things for those more purposeful training days that paper targets simply can’t reproduce (they also absorb a whole lot more punishment). And in that regard, especially considering the marked difference between engaging a target from the side as compared to head-on, the VRT targets might be something worth your consideration. 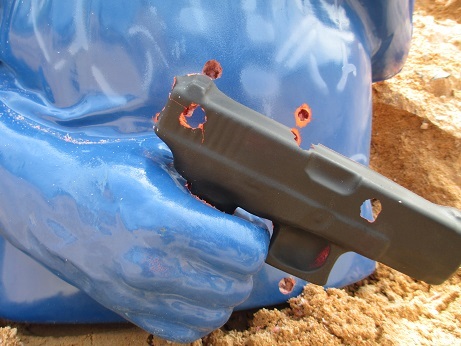 *Handgun Planet would like to thank to ZMB Industries for the evaluation sample used in this review. The T&E for this product was conducted in the form of a “demo day” and the author’s words in this review include much of the feedback obtained from other shooters throughout the evaluation. As one of the lucky members of the group who got to test Greg and Jacob, I fully concur with the author’s assessment. 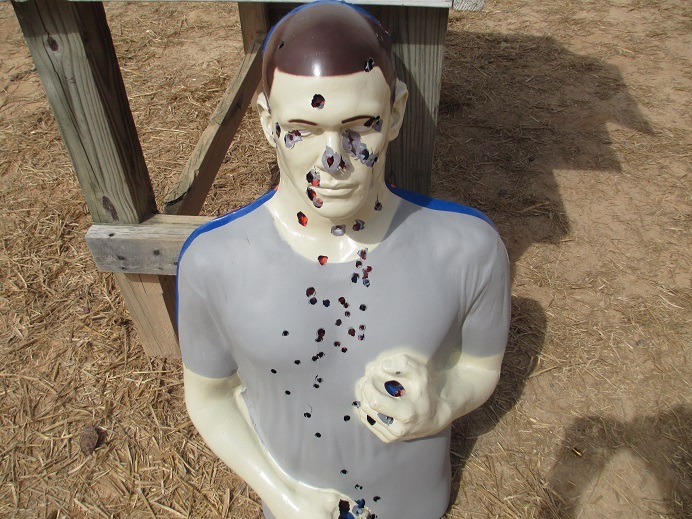 Instant feedback is terribly important in the shooting sports. Watching this target absorb a punishing number of rounds was both impressive and a lot of fun. Kudos to ZMB for making this training aid realistic and durable. Thanks for making it out to the demo, Nick! The targets definitely took some punishment!